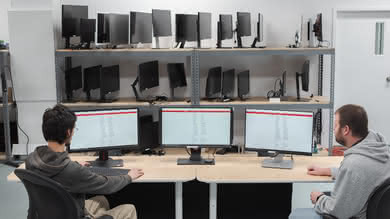 We purchase our own monitors and put them under the same test bench, so that you can compare the results easily. No cherry-picked units sent by brands. What it is: Type of LCD technology used by the monitor. When it matters: Different technologies have different viewing angle properties. What it is: Feature that allows the monitor to synchronize its refresh rate with the input device's output and reduces stuttering and screen tearing. When it matters: Almost every usage, but is most noticeable in gaming where constant fluctuation in framerate cause distracting artifacts. 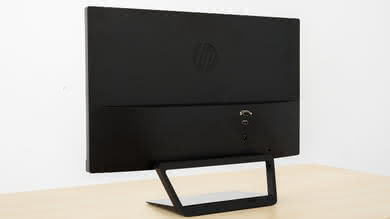 The HP 22CWA is a decent budget monitor with an IPS panel. It lacks more advanced features to improve the picture quality and performance, but still performs okay. It has wide viewing angles, which helps the image to remain uniform when viewed from up close. 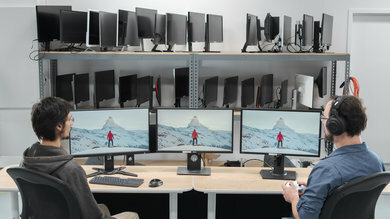 Blacks appear gray in a dark room, but in a bright room, the monitor can overcome some glare due to the good reflection handling and decent brightness. Motion handling is only decent but is limited by the 60Hz refresh rate and the mediocre response time. What it is: The weight of the monitor when mounted. This is with the stand removed, and if necessary any VESA mounting bracket attached. 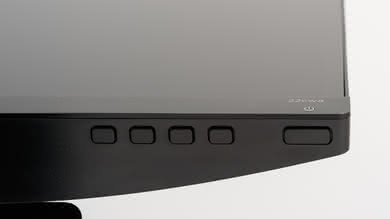 What it is: The weight of the monitor including the stand any any input covers. 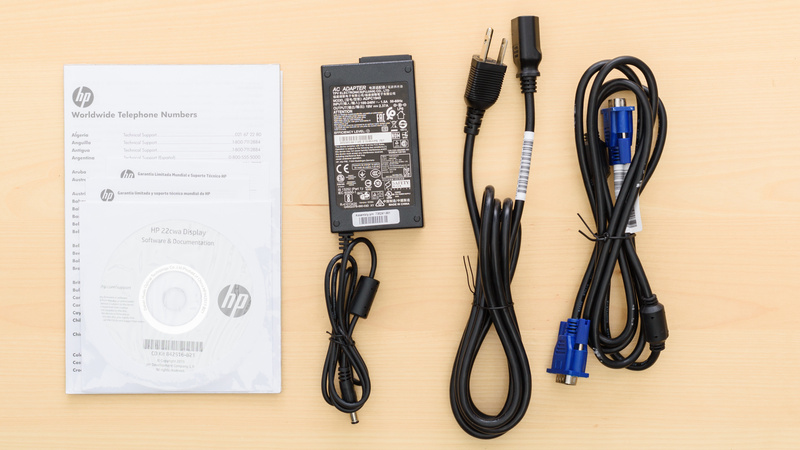 The design of the HP Pavilion 22CWA is mediocre and it is entirely made of plastic. 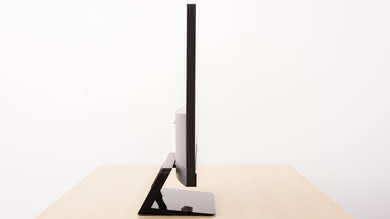 The stand supports the monitor well and does not take much desk space, but it wobbles a little if gently knocked. 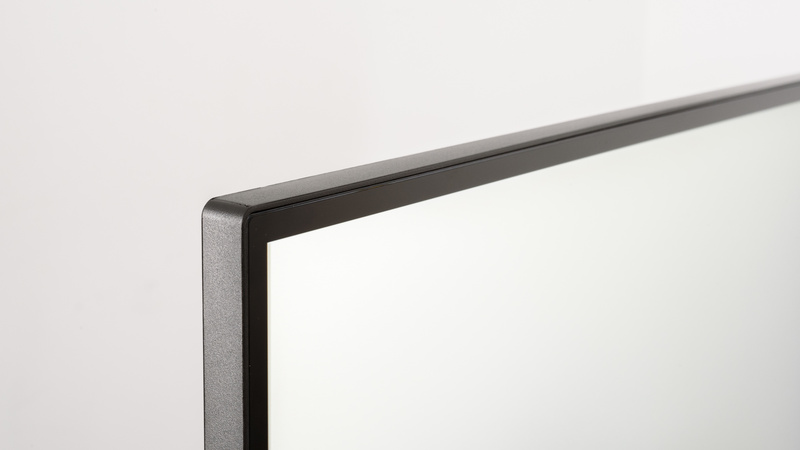 When viewed from the side the monitor looks thin and can be placed close to a wall. Unfortunately, the ergonomics are bad and thus, you will need to spend some time before you can place it in a comfortable position. The build quality feels ok but does not give off any premium feel whatsoever. What it is: The width of the stand. When it matters: When using a small desk, for those who require a monitor with a small footprint. What it is: The depth of the stand. The stand is plastic, very plain, and wobbles a little if gently knocked. In our case, when mounting the stand to the monitor, we were not able to lock it in place as we did not get the characteristic "click" sound. What it is: How much the position of the screen can be adjusted to match the viewing preference of the user. When it matters: All usages, but especially office and gaming use. What it is: The amount of vertical travel or adjustment of the display. The stand has very limited ergonomic adjustments, so it is more difficult to place it in a comfortable position. The only available option is tilting. What it is: The distance from the left edge of the display to the start of the image. 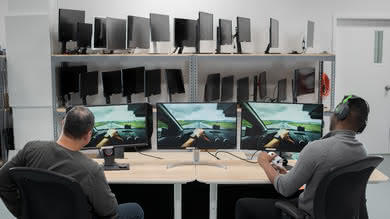 When it matters: When using multiple monitors side-by-side. The borders of this monitor are thin with almost no bezel. There is a gap between the edge and where the pixels start. 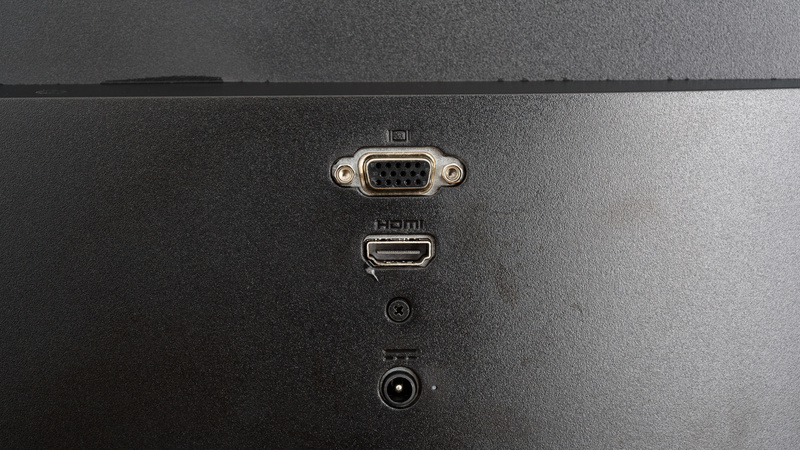 What it is: How far the front of the screen protrudes when placed as far back as possible against a wall. When it matters: When the monitor is placed back against a wall. What it is: How far the front of the screen protrudes when the stand has been removed. 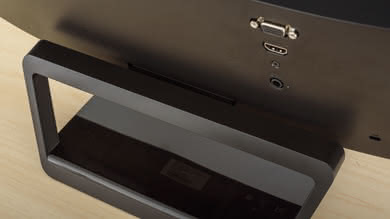 For monitors which require a bracket to VESA mount this measurement includes the thickness of the bracket. 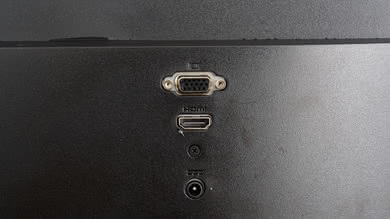 When it matters: When mounting a monitor with the stand removed. The HP Pavilion 22CWA is fairly thin when viewed from the side, so you can easily place it close to a wall. What it is: How well built and sturdy the monitor is, and how good the materials used to build it are. When it matters: All usages. The built quality of the monitor is mediocre. 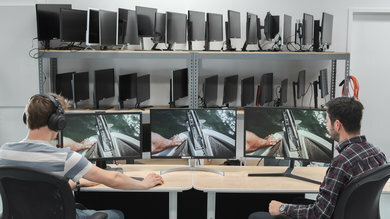 There are no loose ends or any gaps, but the monitor does not feel firm and the issue with the stand not clicking into place emphasized that feeling. The HP 22CWA has a mediocre picture quality. It can not display deep blacks in a dark room. Its brightness levels and good reflection handling make it more suitable for brighter rooms. 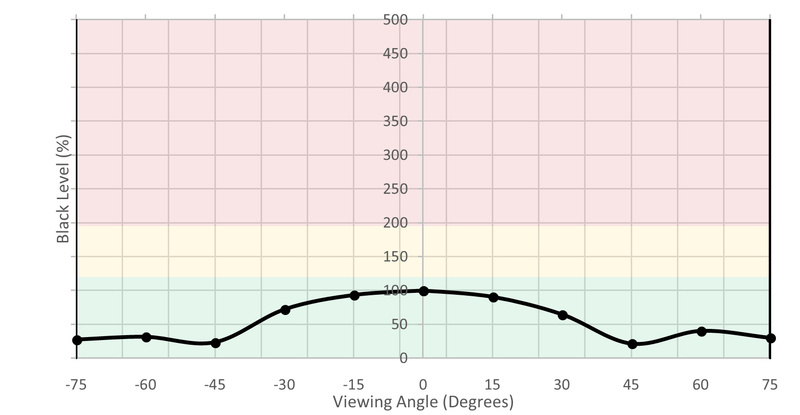 The viewing angles allow you to view it from the side without significant loss of accuracy. The monitor has great gray uniformity, good out-of-the-box color accuracy, and a very good color gamut. The contrast of the HP 22CWA is mediocre.  If you place the monitor in a dark room, blacks will look grayish. This is typical of IPS monitors. Good value: Full-array/direct lighting is better for local dimming. As for the uniformity of the screen, it depends on the implementation. 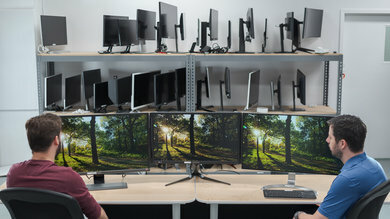 Some edge-lit monitors have more uniform blacks than some full-array monitors. 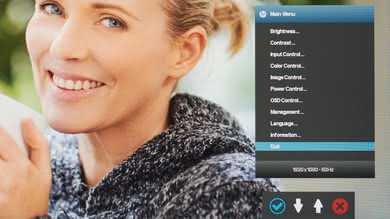 The HP Pavilion 22CWA does not have a local dimming feature. The video is for reference only. What it is: The maximum luminosity, even if only maintained for a short time, of a white square covering 2% of the screen, with the monitor set to be as bright as possible. Measured with local dimming and over SDR signal. What it is: The maximum luminosity, even if only maintained for a short time, of a white square covering 10% of the screen, with the monitor set to be as bright as possible. Measured with local dimming and over SDR signal. What it is: The maximum luminosity, even if only maintained for a short time, of a white square covering 25% of the screen, with the monitor set to be as bright as possible. Measured with local dimming and over SDR signal. What it is: The maximum luminosity, even if only maintained for a short time, of a white square covering 50% of the screen, with the monitor set to be as bright as possible. Measured with local dimming and over SDR signal. What it is: The maximum luminosity, even if only maintained for a short time, of a white square covering 100% of the screen, with the monitor set to be as bright as possible. Measured with local dimming and over SDR signal.  What it is: The lowest maximum luminosity (usually after it has stabilized) of a white square covering 2% of the screen, with the monitor set to be as bright as possible. Measured with local dimming and over SDR signal. What it is: The lowest maximum luminosity (usually after it has stabilized) of a white square covering 10% of the screen, with the monitor set to be as bright as possible. Measured with local dimming and over SDR signal.  What it is: The lowest maximum luminosity (usually after it has stabilized) of a white square covering 25% of the screen, with the monitor set to be as bright as possible. Measured with local dimming and over SDR signal. What it is: The lowest maximum luminosity (usually after it has stabilized) of a white square covering 50% of the screen, with the monitor set to be as bright as possible. Measured with local dimming and over SDR signal. 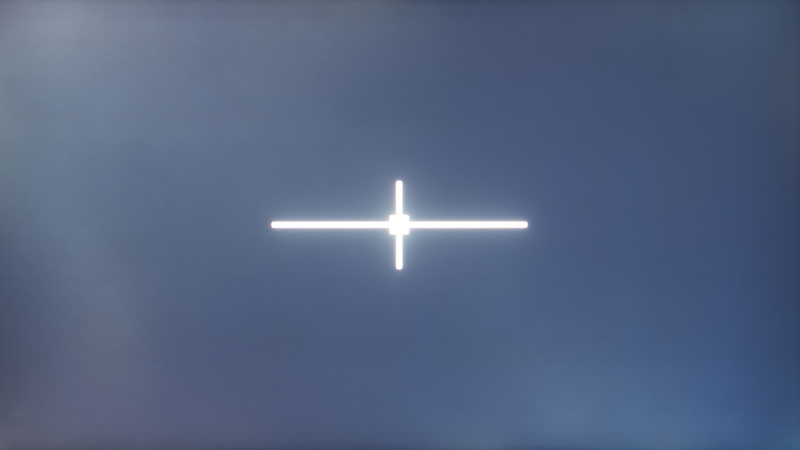 What it is: The lowest maximum luminosity (usually after it has stabilized) of a white square covering 100% of the screen, with the monitor set to be as bright as possible. Measured with local dimming and over SDR signal. What it is: How bright the screen can get. Measured with local dimming and with HDR content. 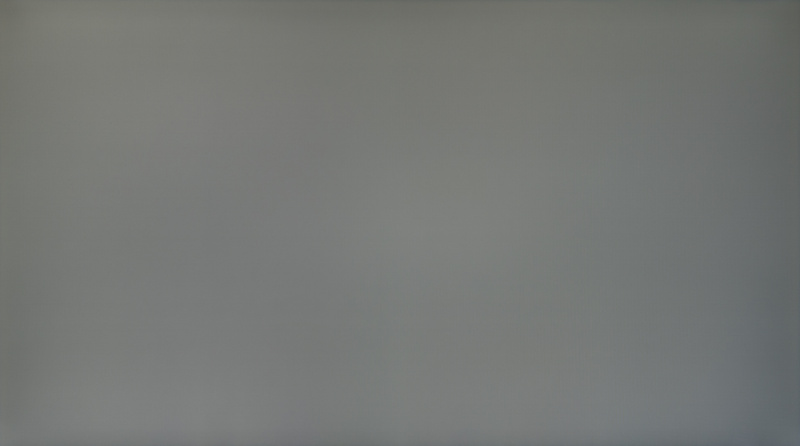 What it is: Angle where the colors noticeable shift compared to when viewed from directly in front of the monitor. 0 ° means directly facing the monitor. Measurements are up to a maximum of 75 °. What it is: Angle where the brightness drops to 50% of the brightness directly in front of the monitor. 0 ° means directly facing the monitor. Measurements are up to a maximum of 75 °. When it matters: When sharing your monitor with people on your left. When it matters: When sharing your monitor with people on your right. 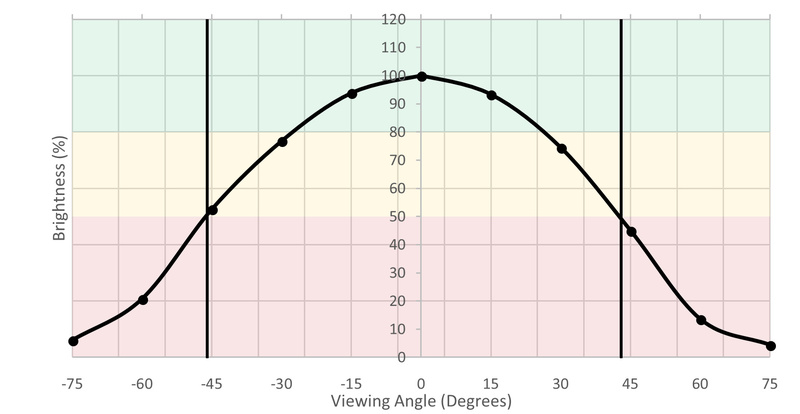 What it is: Angle where the black level drops to 50% of the black level directly in front of the monitor. 0 ° means directly facing the monitor. Measurements are up to a maximum of 75 °. The horizontal viewing angles are decent. The colors and the brightness remain accurate when you look at them from slightly wider angles. 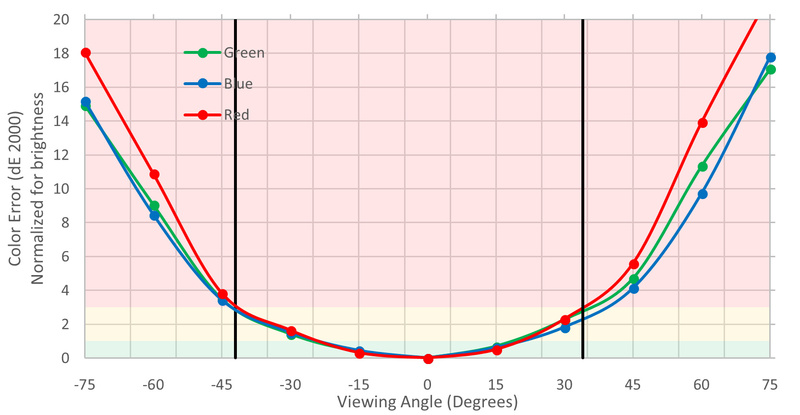 What it is: Color accuracy when viewed from the top or bottom. When it matters: When looking at a monitor from below. When it matters: When looking at a monitor when standing up. When it matters: When looking at a monitor while standing up. The vertical viewing angles are very good. You do not have to place the monitor right in front of you to get an accurate image and this is great. This monitor has excellent gray uniformity. Most people will not notice any clouding or dirty screen effect while browsing the web or watching sports clips. The black uniformity of this monitor is poor.  In very dark scenes clouding is noticeable especially close to the corners. 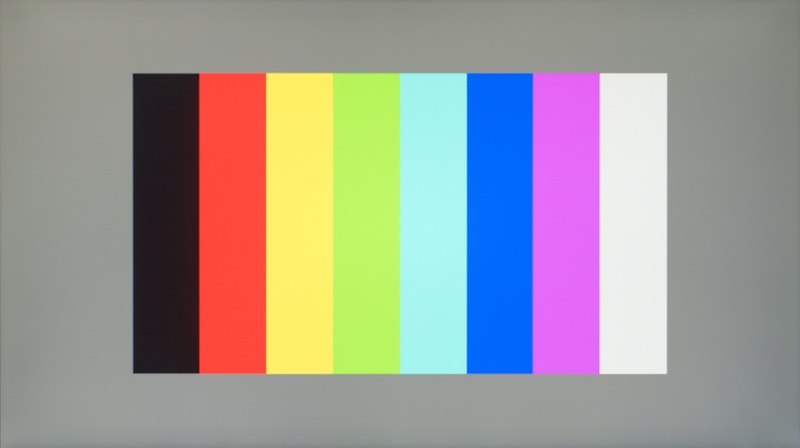 What it is: Monitor's color accuracy before a full calibration. The measurements are taken with out of the box 'factory setting'. What it is: The picture mode that was used to do the pre-calibration reading. We usually go for the picture mode that gives us the more control over all the picture quality setting. 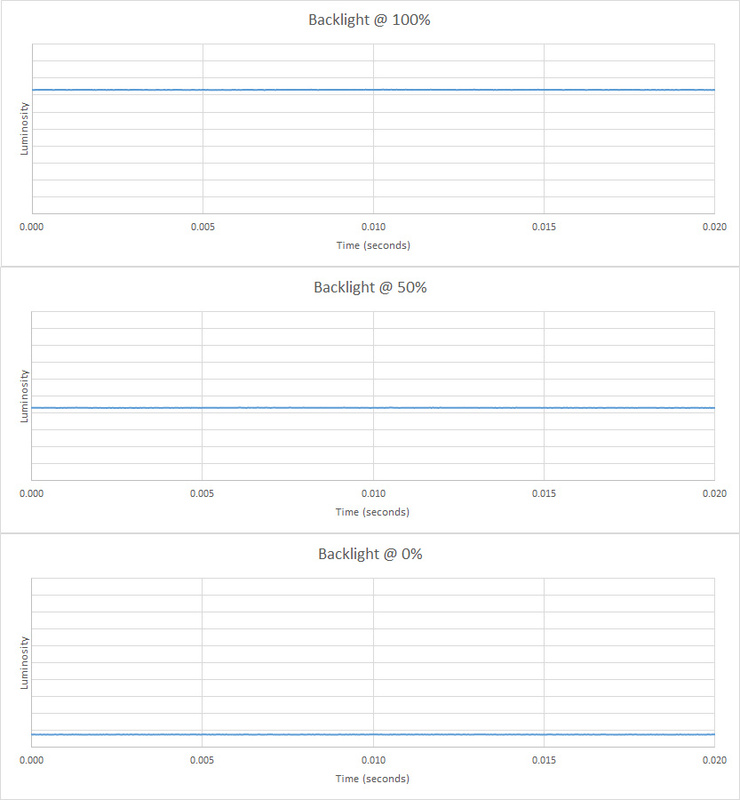 What it is: The luminance at which the pre-calibration reading was done. 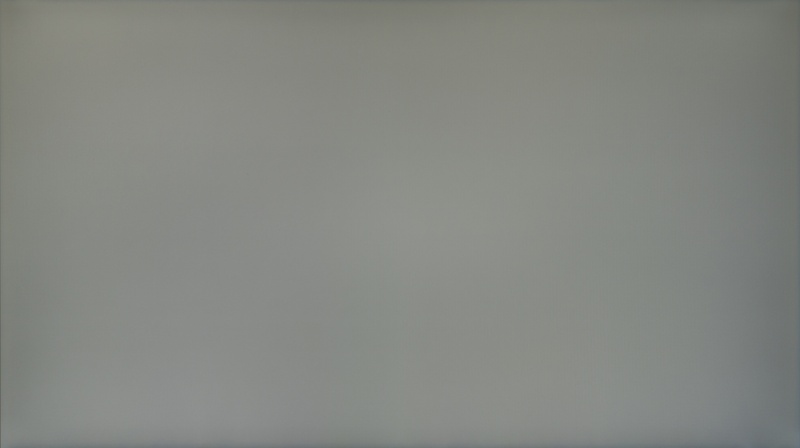 This represents the luminance of the monitor when it is at the factory default settings. 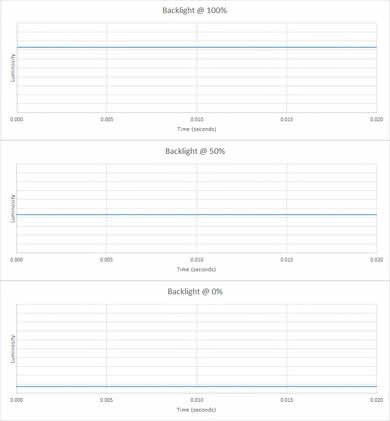 What it is: The luminance settings, often named 'Brightness' on monitors, usually range from 0 to 100. What it is: The monitor contrast setting, usually ranging from 0 to 100. 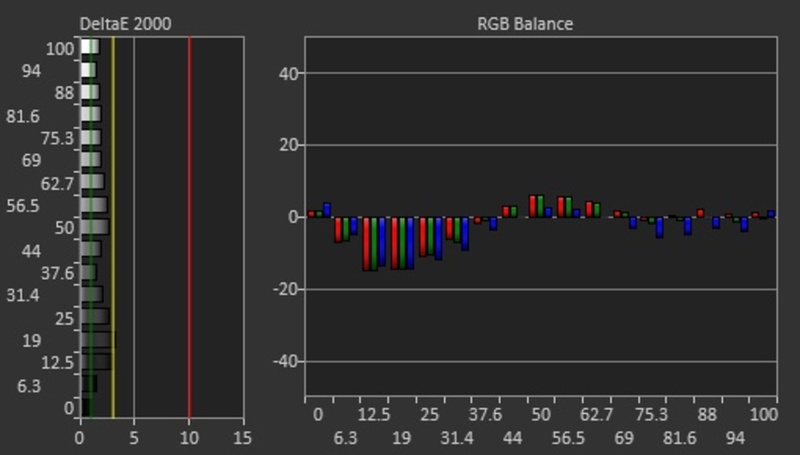 What it is: This is the value for each color (red, green, and blue) used in the monitor internal RGB cuts/gains controls. 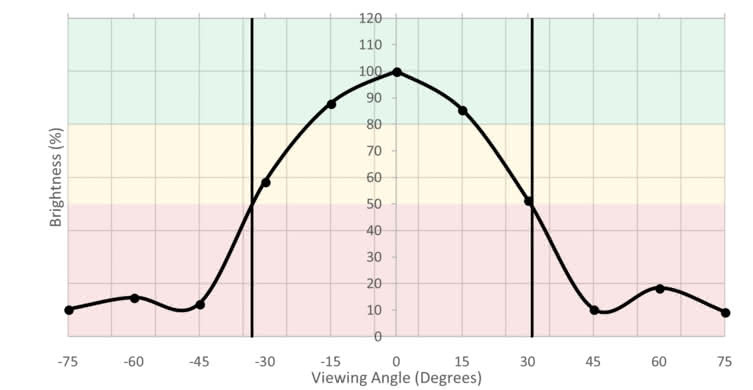 If the monitor does not have an internal RGB cuts/gains controls, then the color temperature setting will be used instead, and the color temperature that gives us the best result will be used. 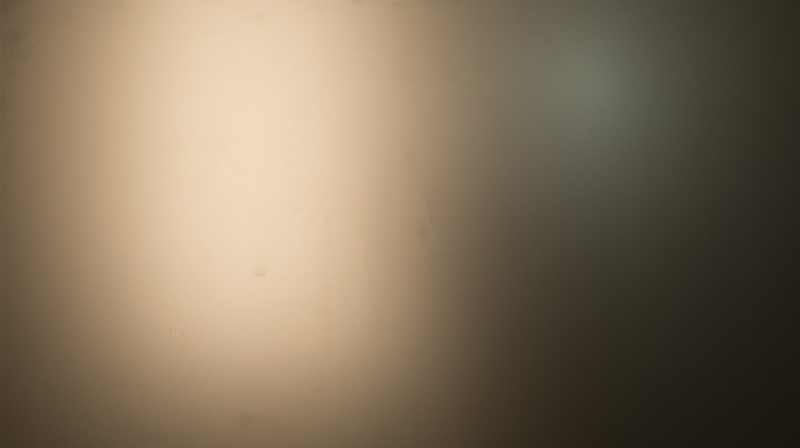 What it is: The color temperature is a measure of the color of light. A colder color temperature (7000K) will look bluer and a warmer color temperature (4000K) will look yellower/redder. 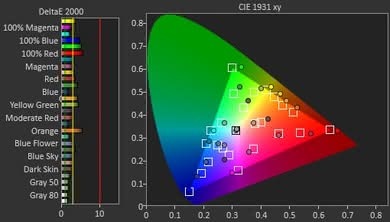 6500K is the standard color for PC monitors and also for the sRGB color standard. When it matters: When you care about color reproduction and accuracy. The out of the box color accuracy of the HP Pavilion 22cwa is good. We found that the most accurate picture mode was when we set Quick View to Custom with Color Control set to Custom (RGB) and Black Stretch set to off. With these settings selected some people might still be able to spot color inaccuracies. 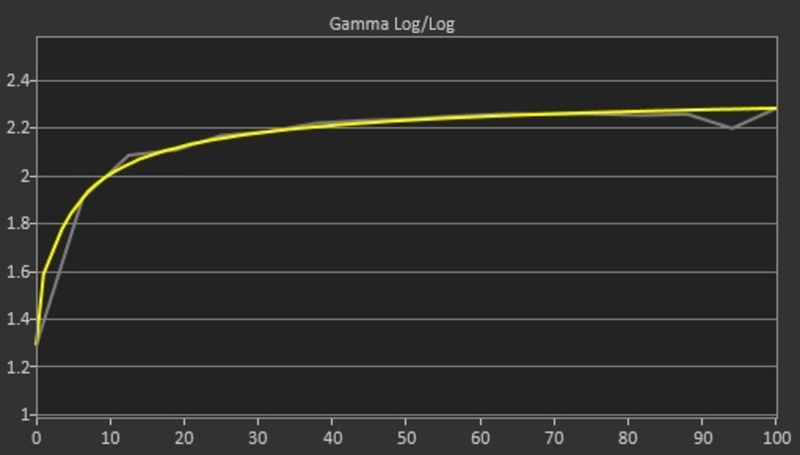 Finally, the gamma curve is not tracking our target very closely. 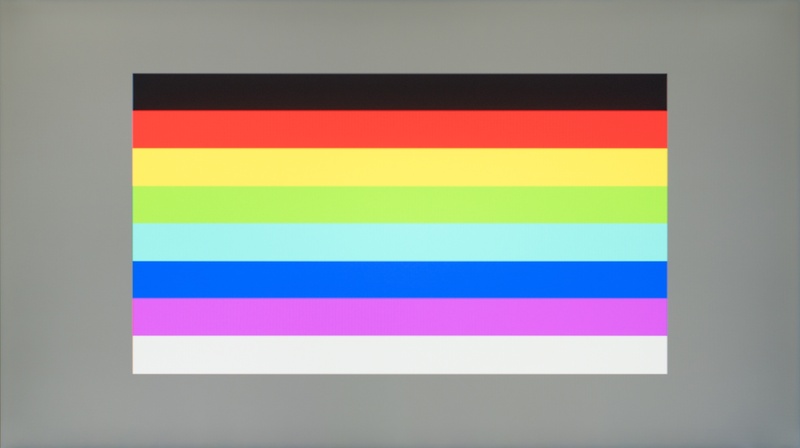 What it is: Monitor's color accuracy after a full calibration with a spectrophotometer. When it matters: All graphics and video content on a monitor that has been professionally calibrated. What it is: The picture mode that was used to do the calibration reading. We usually go for the picture mode that gives us the more control over all the picture quality setting. What it is: The luminance at which the calibration was executed. We aim for a luminance level of 100 cd/m². After calibration, the accuracy of the HP 22CWA is excellent. Both the white balance dE and the color dE were brought down to very small levels where it is almost impossible to spot inaccuracies. 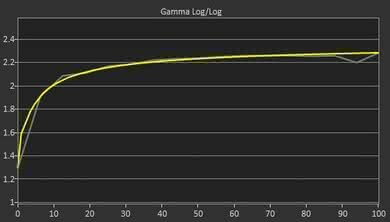 The gamma and the color temperature were improved closer to our targets. 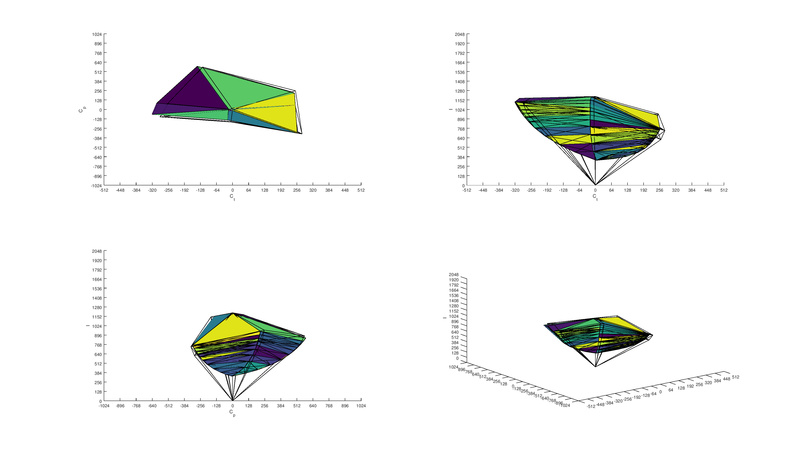 You can download our ICC profile calibration here. 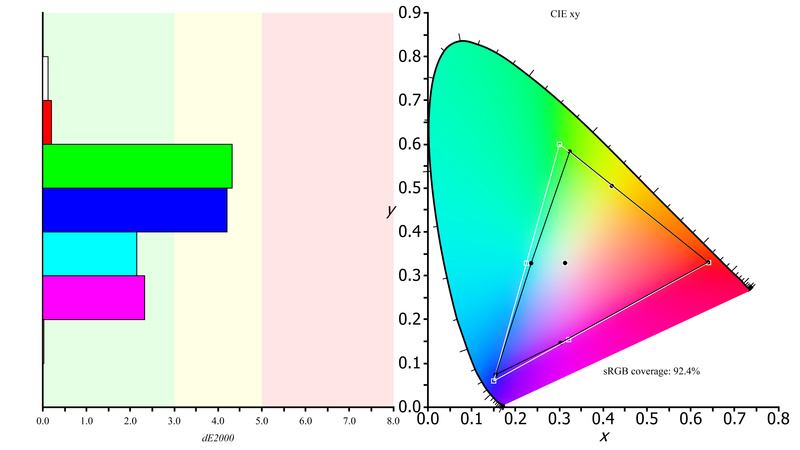 What it is: Coverage of the sRGB colorspace on CIE 1931 xy. 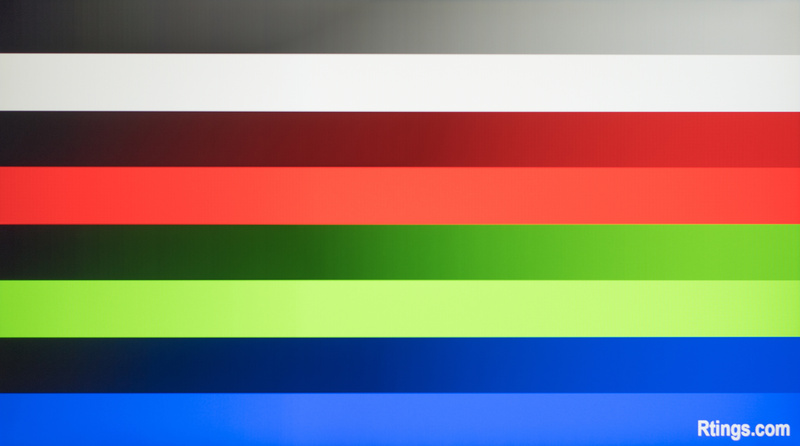 What it is: Coverage of the Adobe RGB colorspace on CIE 1931 xy. When it matters: Professional photography. 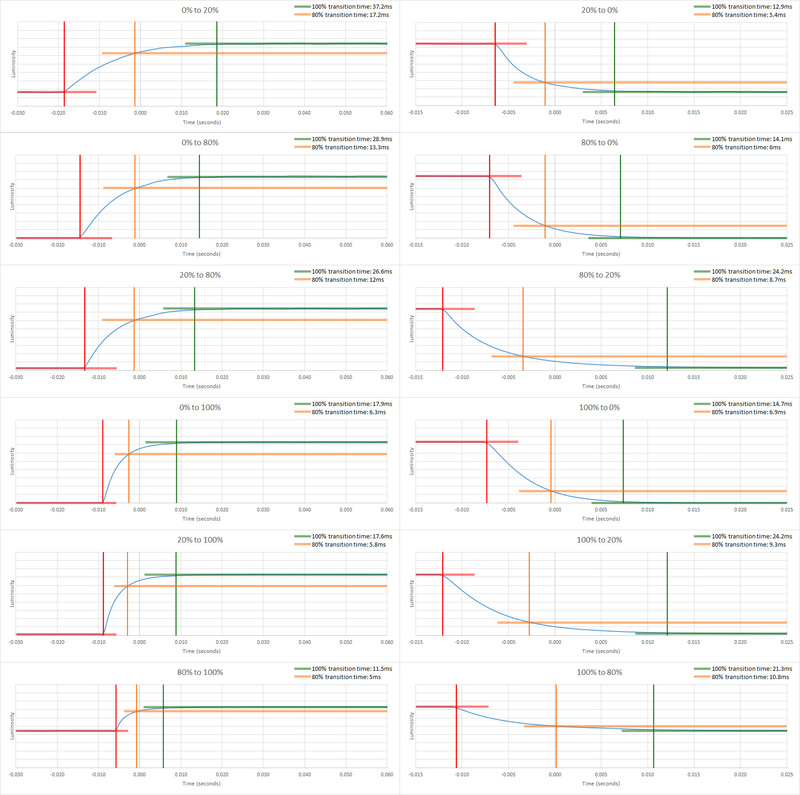 The SDR color Gamut is very good. It has an excellent coverage of the s.RGB color space, but the color coverage of the Adobe RGB color space is limited. This does not make it a great option for professionals in the photo editing domain. 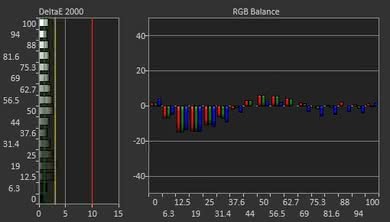 What it is: How much of the Adobe RGB colorspace a monitor can display at different luminosity levels, normalized to the monitor's peak brightness. 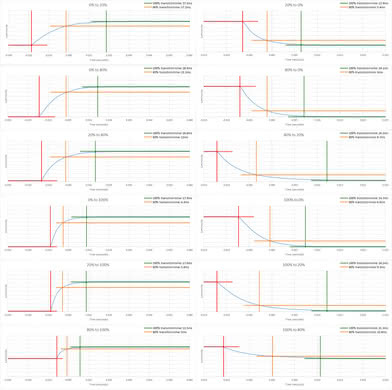 Good coverage of SDR color volume. 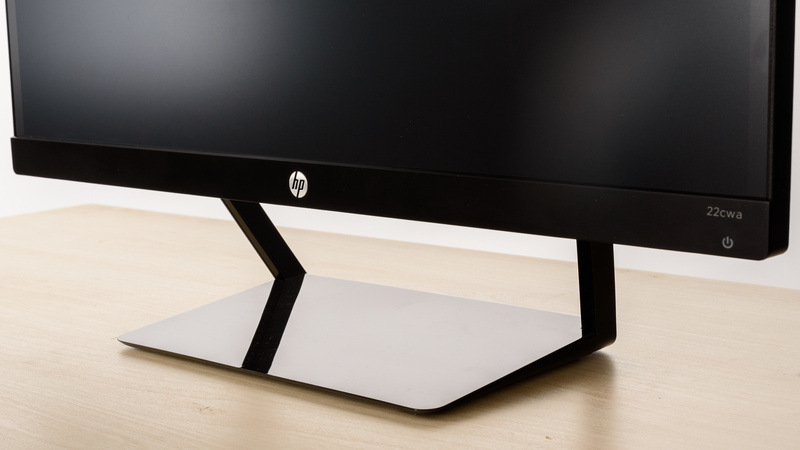 The HP Pavilion 22CWA covers adequately the standard s.RGB volume, but does have a lesser coverage of the Adobe RGB color volume due to its limited coverage of the Adobe RGB color space. In both cases, the monitor's limited contrast ratio does not allow it to cover well the darker brightness levels. 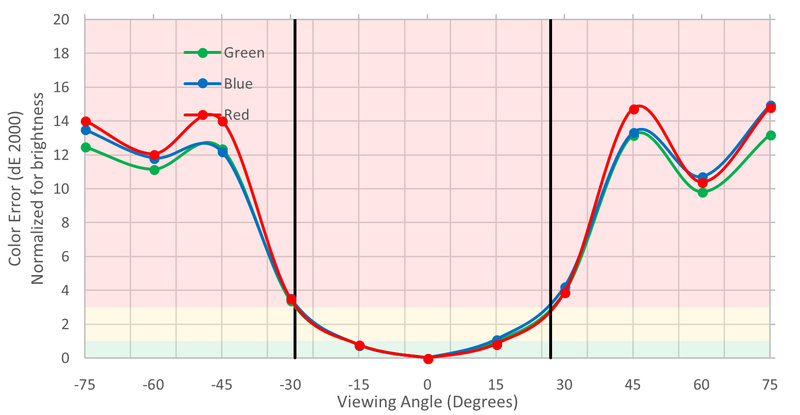 When it matters: When consuming or producing HDR content. What it is: How much of the HDR color spaces a monitor can display at different luminosity levels. When it matters: HDR content consumption and production. Includes streaming services, UHD Blu-rays and HDR games. What it is: How much of the DCI-P3 colorspace a monitor can display at different luminosity levels, normalized to the monitor's peak brightness output. When it matters: HDR content. What it is: How much of the Rec. 2020 colorspace a monitor can display at different luminosity levels, normalized to the monitor's peak brightness output. What it is: How much a static image is retained on a monitor screen after a certain amount of time. 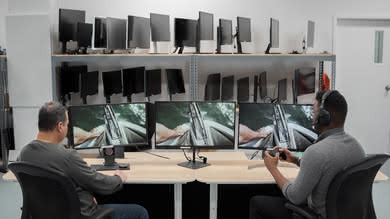 When it matters: When working or playing video games on your PC monitor. 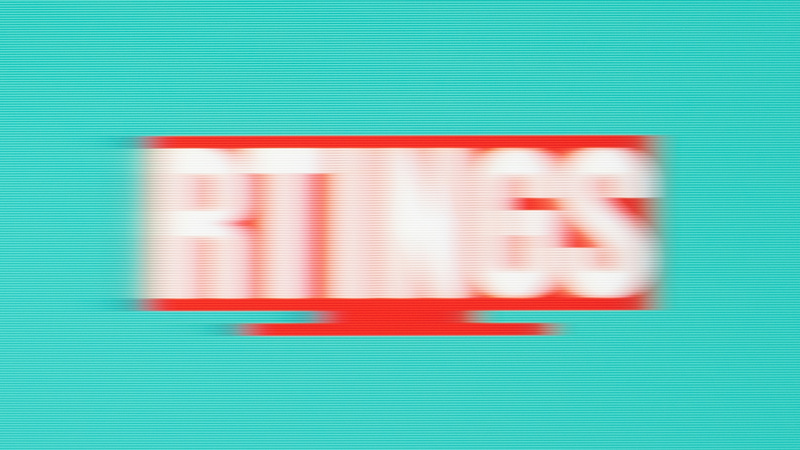 When it matters: When changing use or right after changing the type of on screen content (i.e. stopping playing video game to watch a movie). 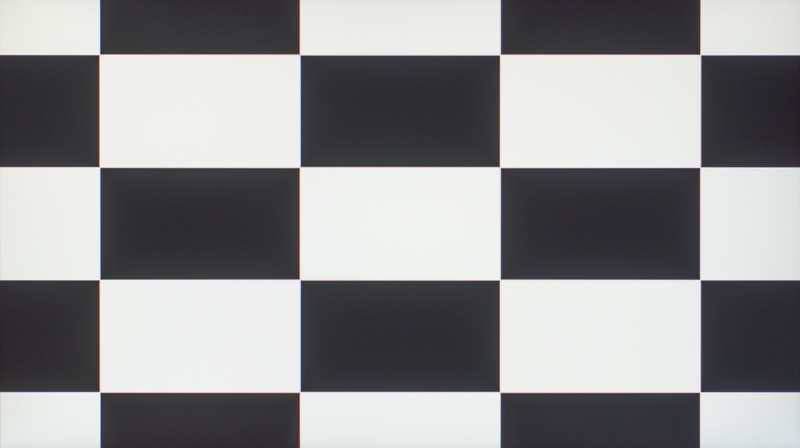 The HP 22cwa shows no signs of image retention after our 10-minute burn-in scene. When it matters: HDR content like HDR video games or HDR UHD movies. Won't matter for regular Blu-ray movies, SDR video game or desktop environment content displayed from a Windows PC. Those are limited to 8-bit color. The gradient performance of this monitor is decent.  There is visible 8-bit banding in the darker shades. What it is: How much the color from one area of the screen affects the color in another area of the screen. When it matters: All usages, but especially media creation. What it is: The amount of bleed that appears across the screen horizontally. 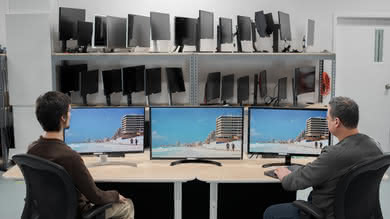 When it matters: General usage of a PC monitor, can appear when browsing the web or with media creation like graphics. What it is: Amount of color bleeding that appears across the screen vertically. 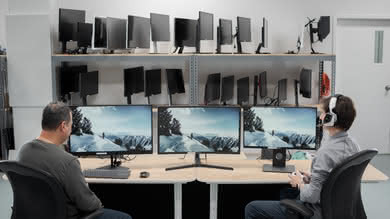 When it matters: Most uses of a PC monitor. Can appear while browsing the web or when editing images or graphics. Perfect color bleed performance. 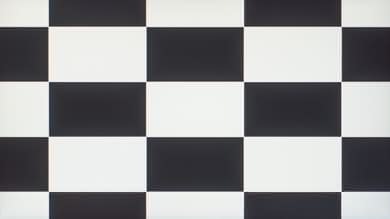 Nearby colors are not affected by large uniform shades and this is great for accuracy. The image reflection handling is good. 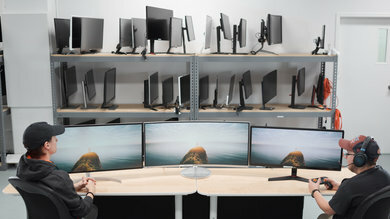 The monitor is able to reduce reflections by diffusing them across the screen. You should have no problems unless you place it in a bright room with many light sources. The HP 22cwa has decent motion handling. The response time is ok and can be slightly improved with the overdrive set to on. However, the monitor has a refresh rate of only 60Hz and no option to improve the image any further which is not great for games. 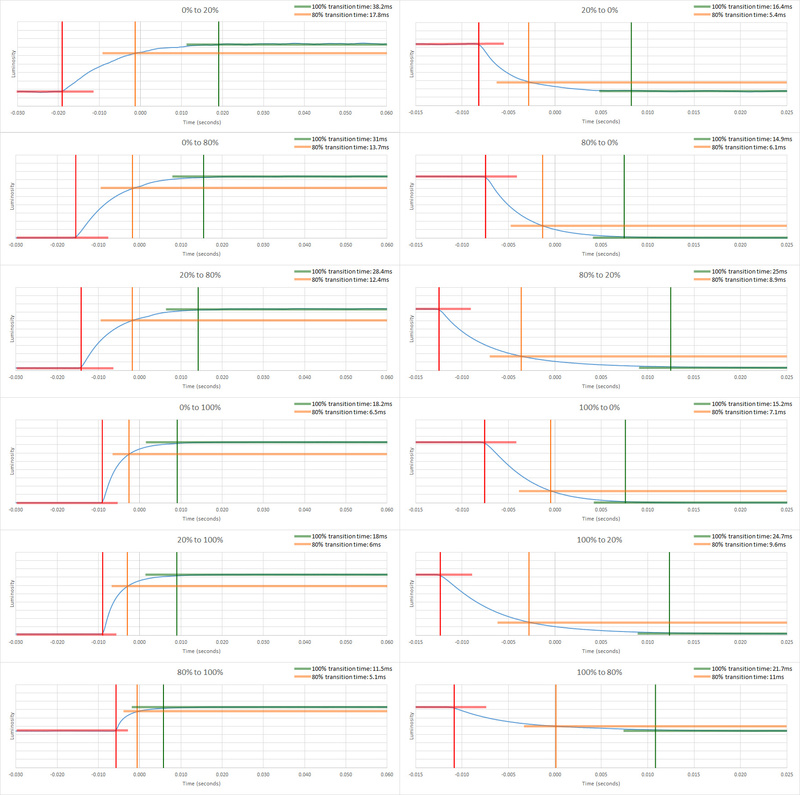 What it is: The performance of the pixel response time. Poor response time causes trails to follow moving objects. Response time is one of a few sources of motion blur. 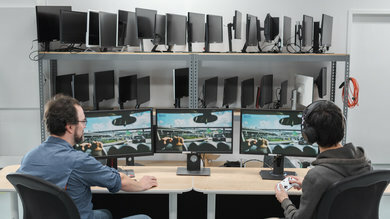 When it matters: When there's fast movement on screen, such as during video games and sports. 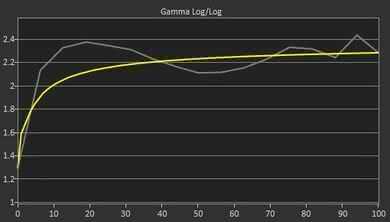 What it is: If the monitor has adjustable pixel overdrive settings, which one produces the best response time with minimal overshoot. When it matters: When adjusting the monitor's settings to get the least possible motion blur. The monitor has a decent response time. When the Overdrive is set to on, it reduces the response time by 1ms without introducing overshoot and therefore we recomend that you set it to on. What it is: Flickering pattern at different luminosities. When it matters: For people sensitive to flickering. Good value: N/A or high frequencies (> 300 Hz). Frequencies that are multiples of 60Hz are better. The HP Pavilion 22CWA does not use PWM flicker to dim the backlight. 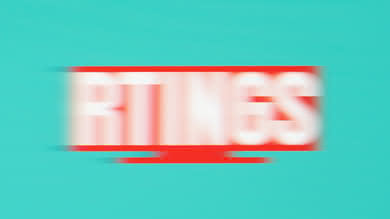 This makes motion look smooth but creates blur. On the other hand, there isn't any black frame insertion option available to add flicker to make the image look crispier by removing blur. What it is: How frequently the monitor can refresh and show new frames, and whether it can vary its refresh rate in real time using technologies like G-sync and FreeSync. What it is: The frequency at which the monitor's can be boosted to using its internal menu. When it matters: Gaming and other usages where high frame rate content is consumed. What it is: We test for FreeSync compatibility with an NVIDIA GTX1060. 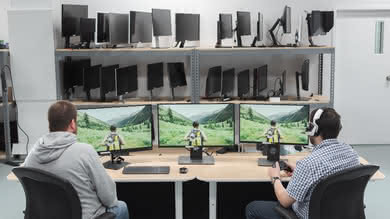 We check for any excess blur, screen blanking, or excess tearing, and confirm the variable refresh rate range. When it matters: If you have an NVIDIA graphics card. What it is: The maximum frequency covered by the Variable Refresh Rate feature of the monitor. When it matters: Any time the VRR feature is enabled. What it is: The lowest frequency covered by the monitor's Variable Refresh Rate feature. 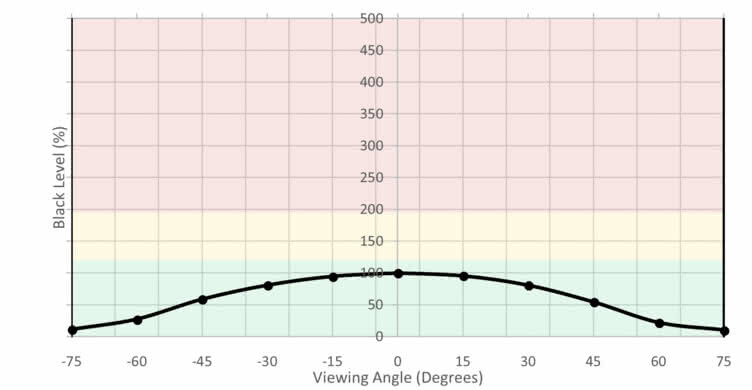 When it matters: When using the VRR feature of the monitor at lower frame rates. What it is: The maximum frequency covered by the Variable Refresh Rate feature when the monitor's overclocking feature is used. When it matters: When both the overclocking and VRR features are used. Good value: Matching the overclocked refresh rate. 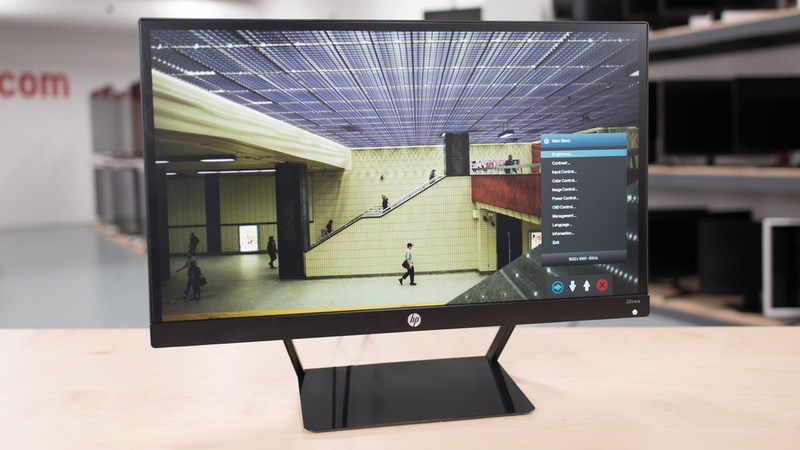 The HP 22cwa only supports the more common 60 Hz refresh rate. This means that motion in video games is not as good as on faster refresh rate monitors. It also does not support Variable Refresh Rate features like G-sync and FreeSync to avoid tearing and smooth out the image. The input lag of this monitor is excellent. However, because of its small size and 1920x1080 resolution, the amount of detail it can display is limited and this might bother some. The number of inputs is also very basic. When it matters: General usage of the mouse and gaming. 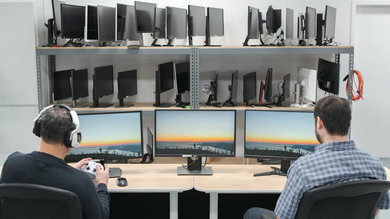 What it is: Lowest input lag possible at the center of the screen, when the monitor is displaying its native resolution at its native refresh rate. When it matters: General usage and while playing video games. When it matters: General usage as well as gaming. What it is: Lowest input lag possible at the center of the screen, when the monitor is displaying its native resolution at a refresh rate of 60 Hz. What it is: Lowest input lag possible at the center of the screen, when the monitor is using its Variable Refresh Rate feature at its native resolution. What it is: Lowest input lag possible at the center of the screen, when the monitor is displaying an HDR signal at its native resolution and refresh rate. 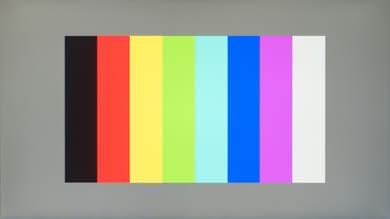 What it is: Lowest input lag possible at the center of the screen, when BFI is enabled and the monitor is displaying a signal at the highest supported BFI refresh rate. Excellent low input lag for this HP 22cwa monitor. 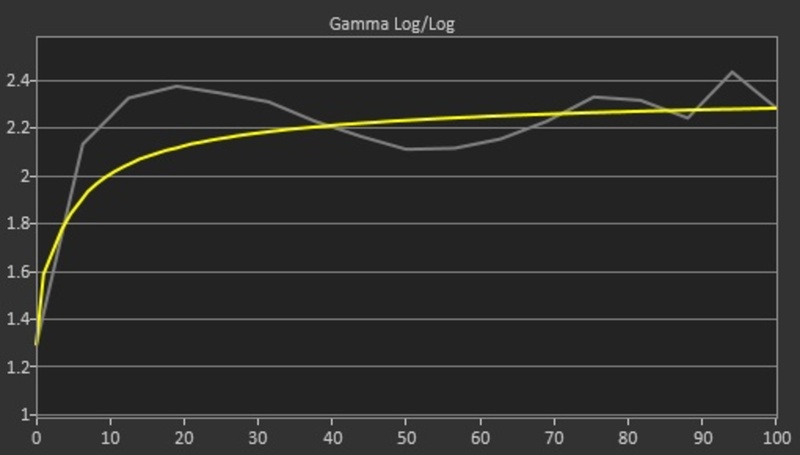 Almost the same low input lag is also found in non-native resolutions and this is great. What it is: The number of pixels the monitor can display, and the surface area of its screen. When it matters: All usages, but especially for office and media editing. This is a 22-inch monitor and the native resolution of FHD is expected. The relatively small size and resolution do not give you a lot of space or detail to work with. This is a very basic monitor and there are no features like speakers nor any other additional features offered on the menu of the On-Screen Display (OSD) other than basic controls. What it is: Whether or not the monitor features standalone speakers. When it matters: When using your computer without headphones or a dedicated pair of speakers. The monitor does not have any additional features like speakers. The menu of On-Screen Display (OSD) is plain and very intuitive. There are 4 buttons on the bottom edge to help you navigate through the menus. We tested the 22" model (22cwa), which is the only size available. If someone comes across a different type of panel or if their HP 22cwa doesn't correspond to our review, let us know and we will update the review. Note that some tests such as the gray uniformity may vary between individual units. 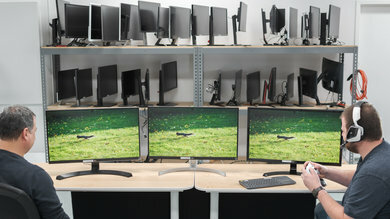 Left: Acer GN246HL. 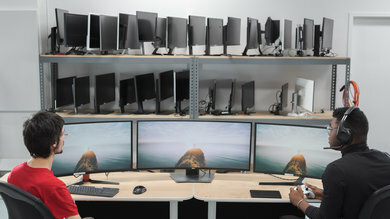 Center: HP 22cwa Right: Acer G257HU . Unlike our other photographs, this picture wasn't taken under a controlled environment, so do not draw conclusions from it. The HP 22cwa is a basic monitor that performs decently in most usages. See our recommendations for the best monitors, the best monitors under $200 and the best budget gaming monitors. The HP 22CWA is an IPS monitor and has much better viewing angles that are good in wide rooms when you look at the image from the side. On the other hand, the ASUS VG245H has a TN type panel and the image degrades at the slightest deviation from the center. The ASUS VG245H has significantly better ergonomics that allow you to easily place it in a comfortable position and is more suitable for gaming with slightly better motion blur and refresh rate. The Dell P2417H is much better than the HP 22CWA. The Dell has much better ergonomics and will not trouble you when trying to place it comfortably. The Dell also has slightly better motion blur. On the other hand, the HP 22CWA has a slightly better vertical viewing angle and marginally better contrast that improves the picture quality in a dark room. If you will be watching the monitor from the side, the IPS panel of the HP 22CWA is a better choice as it has better viewing angles than the Acer GN246HL that has a TN panel. 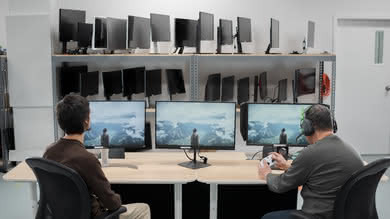 The HP has also better gray uniformity which improves picture quality, whereas the Acer has somewhat better motion blur and marginally better refresh rate, which is important to gamers. 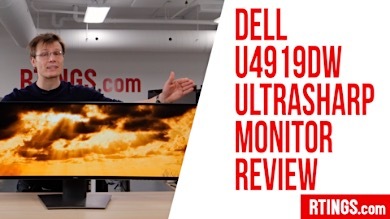 The Dell P2217H is a much better monitor than the HP 22CWA. The Dell has significantly better ergonomics that allow you to easily position it to your likings, and this is important for all usages. The Dell also has marginally better motion blur. The Dell also has slightly better picture quality, due to somewhat better black uniformity which is good for dim scenes in a dark room. This is a decent monitor for mixed usage. 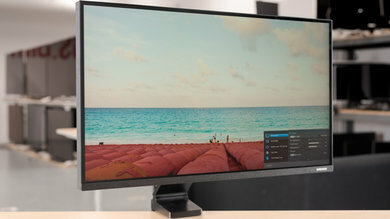 It is a relatively small size monitor with FHD resolution that is not very suitable for those seeking more screen area and good detail to work. On the other hand, it is very portable, has a low input lag and will please most gamers. 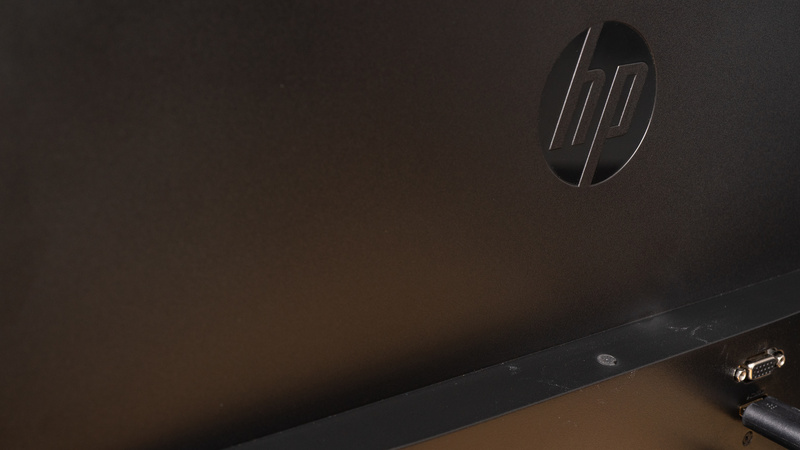 The HP Pavilion 22CWA is a decent monitor for office use. 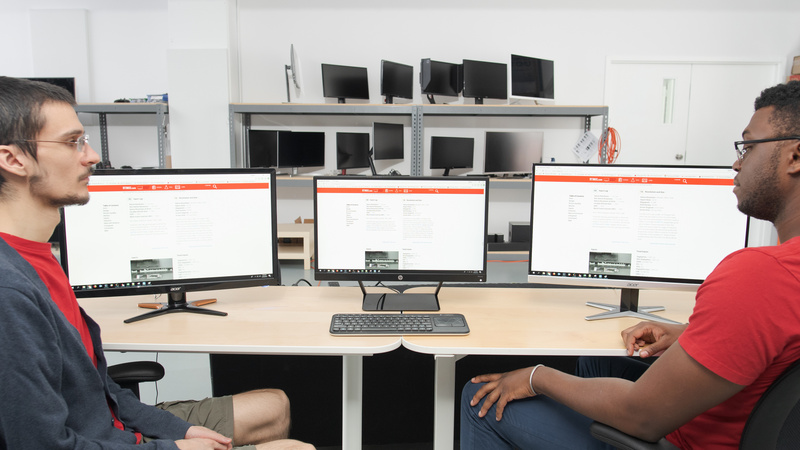 It has very good viewing angles to allow you to work side by side with your colleagues, but the bad ergonomics will not make it easy to position it at a comfortable position. At the same time, you might find the relatively small size and the less detail that comes along the FHD resolution limiting. The HP 22CWA has decent performance in gaming. It has a remarkably low input lag that makes it very responsive but at the same time, it lacks more advanced gaming features that would allow it to further improve the image. 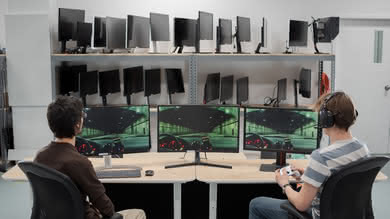 It is better suited for brighter gaming rooms since dark scenes look washed out in dim environments. Decent multimedia performance for this HP 22CWA. Its small size makes it portable so you can watch your favorite movies on the go, but the resolution is limited to FHD and the monitor is suitable for brighter rooms. The bad ergonomics will trouble you when you try to place it in a comfortable position, but due to the good viewing angles, you do not have to sit right in front. 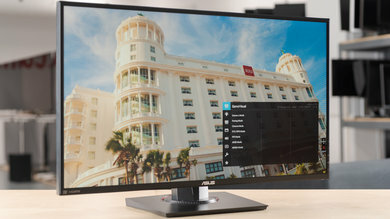 The HP 22CWA is a mediocre monitor for use in media creation. Resolution and size are ok although they will not accommodate those looking for large working area and great detail and the ergonomics might annoy you a little. On the other hand, the monitor has great color gamut and good color volume. Although it is not suitable for a dark room, you can place it in a bright room without worrying too much about reflections. Finally, the viewing angles are good and the image will not deteriorate if watch it from the side. 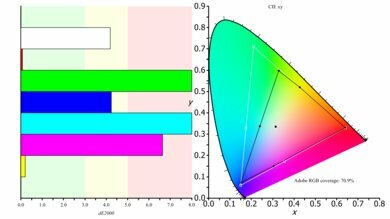 The HP Pavilion 22CWA does not support HDR. 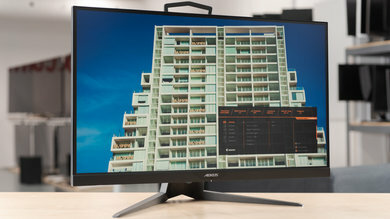 If you are looking for a monitor that supports HDR check the Samsung CHG70.